Ruby Slipper Designs is honored to embark on your business’s branding journey. A brand identity is an essential way to differentiate yourself from your competition. A brand identity influences your customers’ experience at every point and subconsciously affects how they view everything from your industry, your relevance, your trustworthiness. When done well, it is an interwoven tapestry of design, language and experience, all combining to cultivate in a very specific feeling. To distill your brand, Ruby Slipper has a process that defines, differentiates and expresses your identity. To begin, we delve into your organization. We embark on a brand audit, research your customers, your competition, and explore how you wish to be perceived. Then we brainstorm and conceptualize—we go to the drawing board with our stack of research and dive into the artful process of creation. Identities for nature preserves in Ashland, Oregon. Ruby Slipper was asked to brand two nature preserves—each very unique and individual properties in the foothills of Ashland, Oregon. 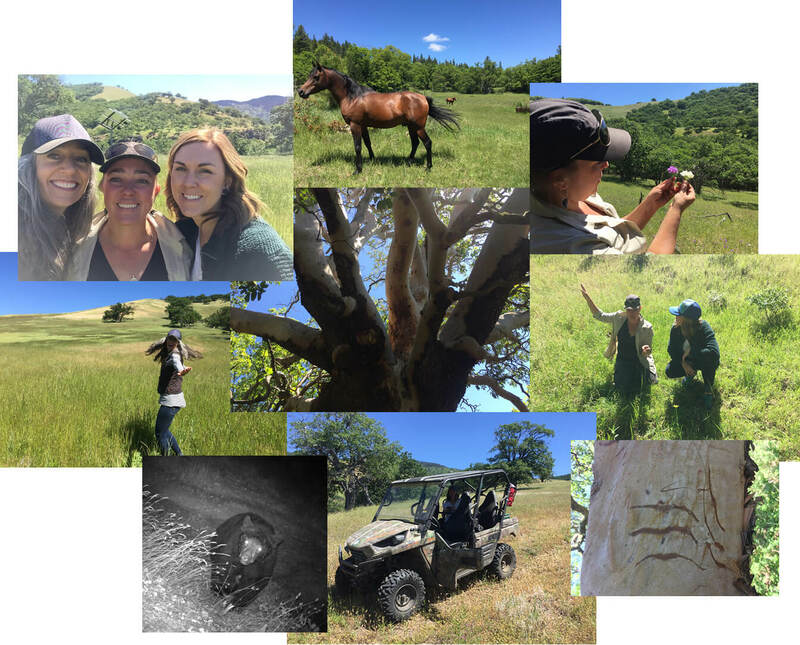 The team kicked off the branding assignment with a foray into the nature preserves. What a splendid way to spend the day! Basking in sunshine, riding a sweet ATV, exploring the paths, all led by resident expert, Maia, the property overseer. She showed us native plants, invasive species, signs of old farm-steading, cougar and bear claw marks on trees, an abandoned mine, horses that have taken residence on the property. We stopped to check the multiple cameras mounted on trees (they are motion-triggered and snap a digital photo if anything moves). Through those we saw countless bears, cougar, deer, all meandering through the forest. And the vistas were unbelievably gorgeous—Mt. Ashland and Pilot Rock—the whole Rogue Valley sprawling before our eyes. After this exhilarating day, Ashley—Ruby Slipper’s brilliant graphic designer—and I got to work. We researched nature preserves, both local and national, and evaluated their color palettes and logos. Many featured oak trees or leaves, some tried to show 8 different elements, others were quite simple. This is not a nature preserve for the casual visitor or the outdoor enthusiast. This is a preserve for scientists, naturalists, and students. It’s private property, with pre-authorized access only. The identities we craft need to emotionally connect with both high-echelon scientists and kindergartners. We met at Remix in Ashland, and amassed a list of everything great and small that we saw on our field trip or had learned over the months of working with Maia. Tiny creatures like yellow legged foothill frog, dusky wings butterflies. Native flowers like the cat ears lily and blow wives. Majestic madrone trees, oaks, conifers. The big animals—Roosevelt Elk, great gray owls, black bears, deer, wolf, and cougars. We listed at least a hundred items and then sat down with Maia to explore. Some were removed right away because they were invasive species (Medusa head), others were dismissed because they are already the champion for another cause or too controversial (wolves, Monarchs, owls). But others were worthy of discussion. What about a symbol or centerpiece? What about combining the small with the large? What about the unique mountain profiles for each of these properties. Ashley got to work, graphically synthesizing these findings into her first round of concepts. Each one has a balance of unique elements—from grasses to mountain profiles to creatures that roam each preserve. The color tones are taken right from the elements, as of course, nature is a central concept. After feedback and several rounds of revisions, Maia chose the circular logos. These identities show key concepts for each locale: a dominant tree (Ponderosa Pine and Oak), an animal roaming the land (black bears and cougars), and the profiles of the mountains where these preserves are located (Grizzly Peak and Buckhorn Peak). They are beautifully balanced and colored to give a sense of each preserve. These now grace the preserves, greeting the scientists, bird watchers, ecologists, and kids—all of whom get to learn from these special, preserved, natural environments. Interested in engaging Ruby Slipper for branding and graphic design services?